Nessan Bermingham (center), the CEO of Intellia Therapeutics, toured the company’s new offices in Cambridge. The fast-growing startup plans to move in Dec. 1. CAMBRIDGE — Nessan Bermingham has the kind of problem most executives wouldn’t mind tackling: His fledgling biotech company is expanding so fast that it’s practically outgrown a new headquarters before the place is even finished. On a recent walk-through of the 65,000-square-foot space on Erie Street, the Intellia Therapeutics Inc. chief executive — his black attire offset by a white hard hat — asked his deputies to figure out how to shoehorn more scientists and equipment into a drug-screening lab under construction. Every square foot counts. “We’re talking about scaling up,” said Bermingham, 43, speaking with a lilt imported from his native County Cork in Ireland. Intellia is one of a trio of startups working locally in the biotech niche known as CRISPR-Cas9. The gene-editing technology was discovered just four years ago, but already it’s sparked a frenzied competition to develop the first of potentially thousands of treatments for genetic disorders. Speed is the new watchword in the global biotech hub of Cambridge. Drug development historically has been a slow process – it often takes more than a decade to bring a medicine from lab to marketplace. But that’s changing, thanks to new machines that can screen drug targets faster and an entrepreneurial environment that’s more akin to high-tech than Big Pharma. Intellia had two employees, Bermingham and an assistant, when Atlas Venture launched it in the firm’s Cambridge “seed space” in the winter of 2013. Since then, it has grown to nearly 100 workers across three sites, and its staff could double by the end of next year. The company has struck high-profile collaboration deals with Swiss drug giant Novartis AG and Regeneron Pharmaceuticals Inc. of Tarrytown, N.Y. It raised $108 million in an initial public offering in May. Its scientists are working feverishly on gene-editing treatments for everything from the hepatitis B virus to a rare form of blindness. If all goes well, it could move its earliest drug candidates into clinical trials within 18 to 24 months. About an hour later, more than 40 scientists and researchers gathered for a “scientific chat” around a cramped bank of desks in the overcrowded office Intellia now operates out of 130 Brookline St., just a few blocks away from the new headquarters. Nessan Bermingham, chief executive of Intellia Therapeutics, started the business with one other employee in 2013. The startup now has about 100 workers. The goal of the session was to keep up with the steady stream of scientific literature in the young field of gene editing, in which researchers use a tool that serves as a kind of molecular scissors to cut defective mutations out of genetic material and replace them with healthy cells. Their aim is to come up with what Formela calls a “permanent rewriting of genetic sequence.” CRISPR-Cas9, the tool being deployed by Intellia and its competitors, is thought to be the fastest and most accurate way to do this. 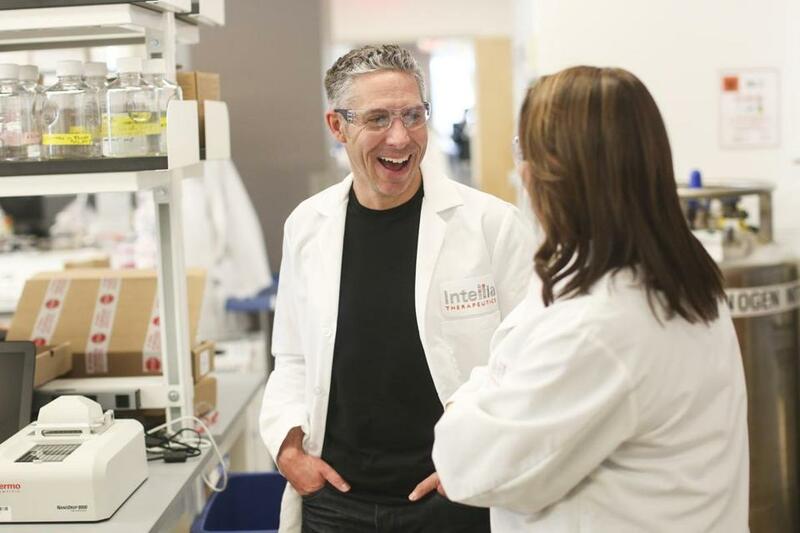 Intellia employees, from senior executives to junior research technicians, listened intently. Wearing a black T-shirt, Bermingham was the most casually dressed person in the room. The molecular scientist and former venture capitalist sat curled up in the window sill, his feet propped on a radiator, typing away on a laptop. He alternately conducted online searches for the scientific papers Preall referenced and answered a flood of e-mails about Intellia. Waiting until others had asked their questions, he piped in with one of his own — what’s the potential for viruses to integrate into host genomes during gene therapy tests?It sounded like the kind of question only a molecular scientist would ask, even one whose days at the lab bench might be in past. “They won’t let me anywhere near the lab here,” Bermingham joked.